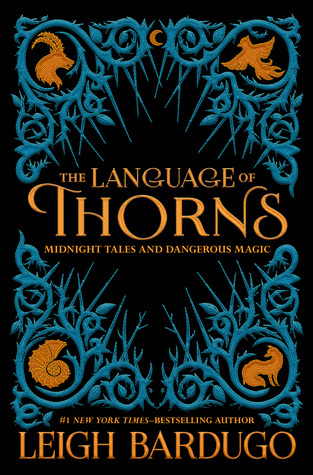 Leigh Bardugo’s The Language of Thorns collects six short stories set in the “Grishaverse”, the world in which her novels like Shadow and Bone and Six of Crows take place. However, these tales are for the most part unrelated to either of those series—a point in this anthology’s favor, in my opinion—and therefore can be enjoyed on their own. It would be more accurate to think of these as fairy tale retellings, each self-contained and often involving their own message and lessons. Personally, I find this format more appealing, as I tend not to get as much out of “side stories” that are tied to (and hence feel “tacked on” to) existing characters and events from a main series. The king and queen of a small kingdom have two sons. The older one is handsome and well-loved, while the younger one was born monstrous and was hence locked away in a labyrinth beneath the castle soon after his birth. However, the beastly prince managed to escape, and is now terrorizing the village. Desperate, the king offers a large reward to anyone who can stop his monstrous son, and the call is answered by young girl named Ayama, whose family neglects her and treats her more like a servant than a daughter. With shades of Cinderella, Beauty and the Beast, and even 1001 Nights, this opening tale is a good example of the kind of stories you’ll find in this collection—magical, subversive, and adheres closely to the classic fairy tale three-part structure. I was immediately transported to another place and another time, my head filled with evocative images of children sitting rapt and cross-legged by the fireside as they listened to their elders tell them stories. There’s a good takeaway from this one too, a reminder that even the most unassuming lives have value and volumes to them. Even from birth, Koja the fox was showing everyone why he was the cleverest animal in all the forest, convincing his mother not to devour him, the scrawniest and scraggliest runt of the litter. Using his quick wit and silver tongue, he somehow always manages to squirm his way out of certain death. However, one day a hunter arrives at the forest, ruthlessly picking off all the woodland animals. Undeterred, Koja decides to pit his wits against the human, confident that he can help end the slaughter. A cautionary tale against hubris, this story is another twist on a popular archetype often found in fairy tales, that of the quintessential trickster. Koja, however, will find that plot twists are none too kind to clever foxes. The protagonist of this story is a woodcutter’s daughter named Nadya who comes from an area where young girls from the surrounding villages frequently go missing. When her mother dies, her father is quick to remarry Karina, a spiteful woman whom Nadya secretly suspects might be a witch. This one might be the darkest tale in the collection, which possibly explains why I liked it so much. Again, there are plenty of subversions and twists, and some truly disturbing themes and imagery found here too, even if they are portrayed rather subtly. This is another story that follows the traditional structure of a classic fairy tale, featuring a greedy duke whose daughter Yeva is so beautiful that the very sight of her instantly causes one to become smitten. When it became time for Yeva to be married, her father decides to hold a competition so that the best man may win her hand. This is a good story for anyone who has ever wondered at the illogical choices made by the typical fairy tale princess character, or why they have to put up with all the crap. The ending to this one is Leigh Bardugo’s brilliant answer to those questions, and it’s just priceless. The Nutcracker gets a nice retelling in this story, but with elements from the Grishaverse to spice things up. Thematically, it reminded me very much of science fiction narratives about artificial intelligence, with messages about moral and philosophical issues that make us question what makes us human or gives us free choice. Bardugo does not manage to go quite as deep as that, however, though not for the lack of trying. Quite honestly, I felt this one of the more lackluster tales, at least when compared to the stronger offerings that came before. Fans of The Little Mermaid will probably enjoy this one, since it draws heavily from that story and offers a different perspective on its villain. It follows a sildroher named Ulla, an outcast among her people on account of rumors that she is half human. Still, she is a talented singer, and together with her friend Signy, the two girls can give rise to wondrous creations through the mere power of their voices. Out of all the stories, When Water Sang Fire is probably the most complex (and it might also be the longest), which is ironic because it did little for me intellectually or emotionally. Personally, I preferred the earlier stories in this collection which held all the charm and magic of traditional fairy tales, whereas this one struck me as rather contrived and a little too “fanservice”. A shame that it ended up being one of my least favorite stories, for I would have preferred ending this otherwise excellent anthology on a higher note. Still, as far as short story collections go, The Language of Thorns is very good one. I don’t often find myself recommending anthologies, but I will in this case, since I think this book would appeal to a wide range of readers, especially those who love fairy tale-inspired fiction and imaginative retellings. Perfect for both fans of the author’s Grishverse and newcomers alike. Audiobook Comments: Having listened to all the books in the Grisha trilogy as well as the Six of Crows series in audio format, I am no stranger to the incredibly talented Lauren Fortgang. She’s capable of doing a huge range of voices and accents, and listening to her narrate this book genuinely felt like I was listening to a master storyteller tell creepy fairy tales around a campfire. I would definitely recommend The Language of Thorns in audio, with the only caveat being that actual book contains some art and illustrations, so I would opt for the print edition if you don’t want to miss out on those. Yea, I definitely want to get the print book. Am looking forward to it though I haven’t finished the Shadow & Bone trilogy or started the duology. I know what you mean. This anthology can be read on its own, but I also like starting with an author’s work from the beginning too if I can. I still have to read the second book following Six of Crows. This does sound good and I like the sound of the audio so I might keep this one in mind as I have credits at the moment. The audio is fantastic. I love Lauren Fortgang! I still have to read Leigh Bardugo! She’s just one of those authors I’ve never gotten around to, although I did buy a copy of Six of Crows. And since I still have to read anything by Leigh Bardugo (although I have “Six of Crows” in my reading queue) I might as well start with these… Thanks for sharing! I assumed these were more closely tied into the original series. I haven’t read the books, but I would be interested in these stories. I love fairy tales. Wow, this sounds so dark and strong! I am wondering about the accents. I’ve recently tried my first audiobook (I’ve only listened to synthetic monotonous voices before) and I couldn’t handle all the weird sounding voices. So cringe-worthy. I am hoping it was that one particular narrator though! I need to get a move on it and read this anthology! I didn’t care for Bardugo’s debut trilogy but I loved her next books (Six of Crows, Wonder Woman, etc.). This anthology is so pretty and I’m sure I’ll love the stories. I’m so glad to see that you did! I really want the print edition of this one! I haven’t been overwhelmed by any of her books, particularly the first trilogy which I never finished but any kind of dark fairy tale has my attention! So so SO glad you gave The Language of Thorns a try! 😉 My favorites were the Thorn Wood, When Water Sang Fire, and The Witch of Duva. But what I loved most about the book was Leigh Bardugo’s writing overall (her prose is absolutely gorgeous, in all six stories) and the illustrations. You should definitely try to get a hold of a copy from the library someday, Mogsy, just to see what they look like. Generally I’m not that big on side stories either, and since I haven’t actually finished the Grisha trilogy I’m pleased to hear that this one sort of stands on its own. Leigh Bardugo is probably one of the most beloved YA authors out there at the moment! She really is! I’m glad her writing career took off after the Grisha trilogy. Her skills have grown quite a bit since too! Yeah I like the fact that they’re unrelated too tbh- cos I also don’t like stories that are more tacked on. This sounds great- and good to know about the physical as opposed to audio format! Yeah I completely relate to that. That’s good.